All Saints Church fundraising events are always well advertised around the village, in the Church newsletter, the local press and on the village website. Many events have taken place already, which are listed below and more are planned for the future. It is hoped that these will continue to be well supported by the people of the parish for this beautiful church's vital role in the spiritual life of the community and many other aspects of village life. More details may be found by clicking on the events which are highlighted. The Church held an "Open Weekend" on 21st and 22nd July with the theme of Celebrations. The Church was adorned with bunting, flags and beautiful floral arrangements. There was wonderful display of works of art by the village school children. The History Group also had a display of various church events and commemorative artefacts. There was a picnic on Saturday afternoon and a Songs of Praise on the Sunday followed by refreshments. Much hard work went into the event which was well attended and considered a success. As part of the Diamond Jubilee village events, a special "Service of Thanksgiving" in celebration of the Queen’s Diamond Jubilee was held on the morning of Sunday 3rd June. This included a Flag Raising Ceremony of the Union Jack on the newly erected flagpole. Many people attended and a light buffet was served afterwards. The church bells were also rung throughout the day. The "Church Christmas Fayre" for 2011 was held on Saturday 26th November in the Village Hall. The usual stalls were there and refreshments were served. The weather was much kinder this year and the event was well attended, raising £768. A "Garden Party" took place on Saturday 11 June in the garden of The Old Nurseries by kind permission of Muriel Levick. The guest opener was panto dame Danny Mills who arrived in costume. There were all the usual stalls along with a raffle and refreshments. There was also a fancy dress competition for the children. The weather was typically “English” but the event was well attended and the total raised was £825. The Church held an "Open Weekend" on 7th and 8th May to mark the Royal Wedding of His Royal Highness Prince William and Catherine Middleton. Village Groups and individuals were invited to create exhibitions for specific wedding anniversaries resulting in some wonderful and imaginative ideas. A great deal of hard work and effort went into the weekend which was well attended and much appreciated by all. This years "Church Christmas Fayre" was held in the Village Hall on Saturday 27th November, on a day of heavy snow. Despite fears that people would not venture out on such a day, many did brave the severe weather and it was well attended. £960 was raised from the event and grateful thanks go to all involved in the organising and who supported making it such a great success. This years "Summer Garden Party" took place on Saturday 19th June in the Spinney behind the Recreation Room. It was cold but no rain during the afternoon. The attendance was low, those who came went round the stalls and then into the Recreation Room for a welcome warm drink. Many thanks go to all those who supported and who were involved in the event. The amount raised was £658.00. "A Concert by The Bel Canto Singers" was held in the Church on Saturday 24th April. The group made up of local people, have sung in churches, chapels and village halls throughout North Notts., helping to raise money for many needy causes. On this occasion the event was in support of All Saints Church. Led and conducted by Beryl Andrew from Saundby their programme included old and modern songs. They were excellent and their enthusiasm was infectious. It was a thoroughly enjoyable evening. After a donation to the Bel Canto Singers who gave their performance free of charge, the event raised £447 for Church funds. This years "Summer Fayre" took place on Saturday 20th June in the Church and grounds with all the usual stalls and a raffle. Homemade refreshments were served in the church making full use of the new facilities in the extension. The weather was kind and over £700 was raised from the event for church funds. 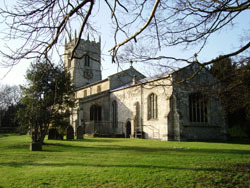 The Church hosted a concert by the "Lincolnshire Hospitals Brass Band" on Saturday 2nd May 2009 at 7.30pm. The 30 strong band led by Musical Director Sue Shorland ARCM gave a first class performance of a selection of music to suit everyone. Greatly enjoyed by around 140 people attending, the event raised £650 for Church funds. A "Family Pancake Social Evening" was held on Tuesday 24th February in the Village Hall, with delicious pancakes and games galore. This raised just over £200 for items required in the new extension. A "Family Pancake Social Evening" was held on Tuesday 5th February in the Village Hall, with pancakes galore. This raised almost £300 for the Church Extension Funds. "A Garage Sale" was held on 19th April from 10am to 4pm at 14 Church View. Many articles were collected and donated and despite being such a bitterly cold day it was well attended and over £700 was raised from the event. The "Summer Garden Party" took place this year on Saturday 21st June moved at the last minute from Mrs Shirley Wilson's garden to the Recreation Room due to the bad weather, which did not put people off going with at times hardly room to move! There were all the usual stalls, a raffle and delicious home made refreshments. The event raised just over £800, thanks go to all involved. On January 17th there was a "Silent Auction and Cheese and Wine Evening" in the Village Hall, which raised £1,000. A "Family Fun Evening" took place on 20th February with quizzes and games, during which pancakes were served. A "Thanksgiving Service and Gift Day" was held in June, when Parishioners were invited to present gifts to the Church, raising £2,500. This included a Sponsored Organ Play by Judith Gourley PCC Treasurer, which began after the church service and continued throughout the day. A "Summer Garden Party" was held with kind permission at the home of Canon and Mrs Frank Levick in July with a raffle and tombola along with various stalls and refreshments. This raised £946. An "Arts and Crafts of a Country Parish" exhibition of the many talented people in the village, was held over the weekend of 8th and 9th September in the church, with many beautiful displays and delicious refreshments served throughout the day. This was considered a great success, raising the sum of £560. Saturday 8th September was also this years Nottinghamshire Historic Trust Churches Sponsored Bike Ride with those taking part cycling or walking round as many churches in the area as possible. Well done to all who took part. £436 was raised of which half will go to Beckingham Church. A "Sausage and Mash Supper and Social" was held in the Village Hall in September. Tasty sausages, mash and peas and a choice of three desserts were served with soft drinks also available. There was a raffle, beetle drive and a quiz making it an entertaining evening raising £218. A "3 Course Sunday Lunch" and sherry reception was held in the Recreation Room on Sunday 14th October, to which 36 people attended, raising £500. Fundraising events for 2006 included a freefall skydive by one of the then Churchwardens Jayne Hanson and her neighbour Neil Thornhill, which raised £1,000 for the church. A Festival was held in the church over a weekend in September 2006 to mark a "Century of Family Celebrations", donations from this were £1,500.